Jay and Elsie – more of my photo’s tagged Elsie. We visited our pup to be yesterday. An adorable springador / labradinger / labradaniel (the elaborate monikers for a Labrador / Springer Spaniel Cross). An experience akin to going for a 20 week scan or something. You get to see her, but not quite time to take her home. We had a choice of the last two girls from the litter. This little lady won my heart. Really tough thing to decide. One of the hardest decisions I’ve had to make in a while! Beautiful wee things all 8 of them and it was lovely to meet their mum and dad. 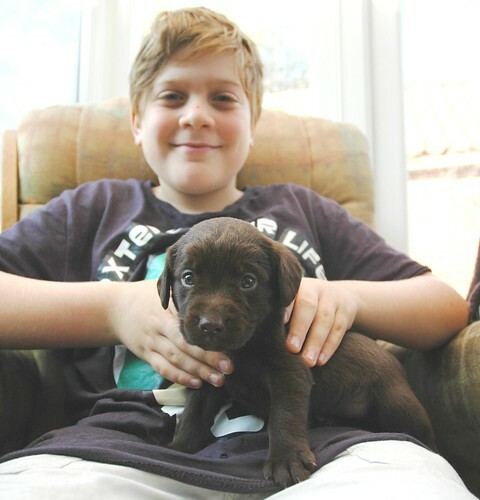 Dad – the chocolate lab is an amazing dog. Mum was a bit shy and perhaps a bit “who are you all coming to see my babies?” but had a very graceful way about her. A heck of a treck – nearly 3 hours (in a car which had a broken stereo) then a puppy pit stop then back again to a slow cook coq o van type thing I’d had brewing all day. Splendid weekend – this was the highlight as far as family life goes but we did have a lovely Saturday tea with friends where I cooked a super doop roast. She is just adorable and great name choice… she would have a giggle at that! Hope the journey down to collect this weekend goes well.